I am currently experiencing an optimistic flow for making new projects. At my Thursday knit night I actually casted on a swatch for a top down sweater. Still haven’t found the right needle size, but the effort is there. About a week ago I printed out a pattern and dug out my stashed yarns for fingerless mittens. 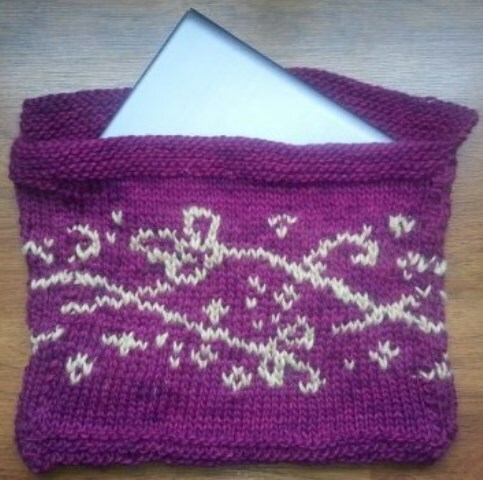 A week or two before that I made about 3 new swatches for the master knitting course and I think I might do some reading today in order to answer some of the written portion. I am on a roll! I am also really scared right now. 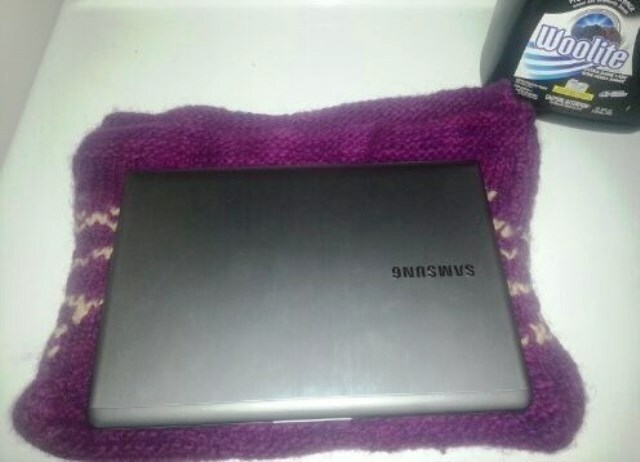 I just threw my lap top case into the washing machine – I am felting! ACK! It is so hard to do something that you have been told repeatedly not to do. This reminds me of a modern art exhibit that I went to while visiting family in Brazil back in September. The artist had covered the floor of his display with broken glass and you were encouraged to walk on it, through and around the barriers he had on it. 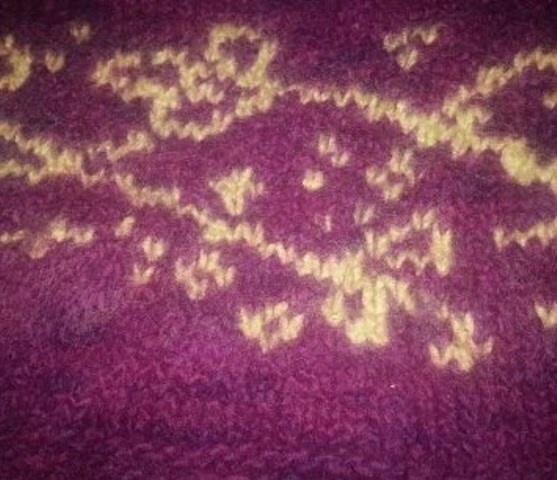 Throwing my knitting into the washer is making me relive that experience and it makes me cringe. You are not supposed to step on broken glass and you’re not supposed to throw your knitting in the washing machine – I don’t know how I am going to last through this wash cycle. Well, actually I do. I know that I have to open the machine every so often and check on it. 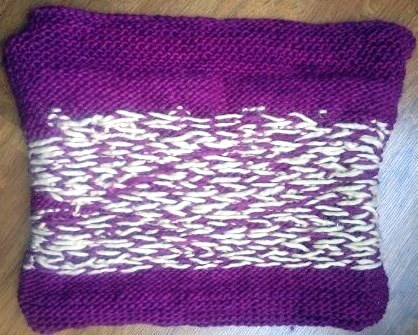 I was also told to put the knitted project inside of a pillow case so that the excess fiber does not clog up the machine. And I am washing it only with like color clothing. I know that denim would be ideal, but I didn’t want to risk the blue staining the tan colored yarn. Sometimes I love the inside look of colorwork knitting as much as the as the outside pattern. I worked really hard to make sure my floats were even! 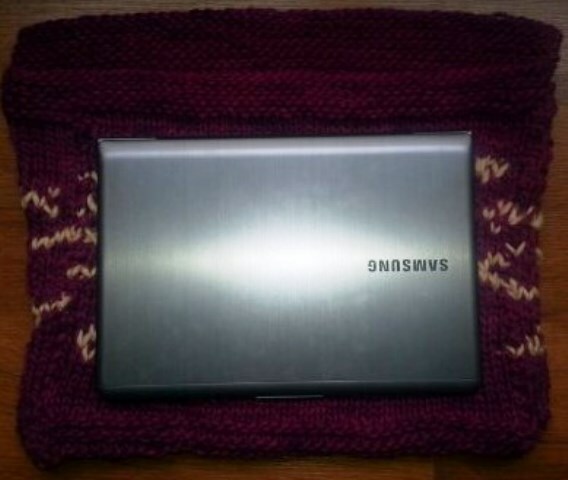 It measures roughly 13 inches x 17 inches (with about 2 inches for the flap). 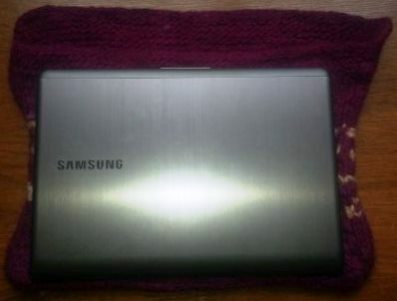 It is currently too big and flimsy to be an effective lap top sleeve, so the felting process has to happen. It is near perfect!! A little cinched in at the middle, but that’s not so bad. 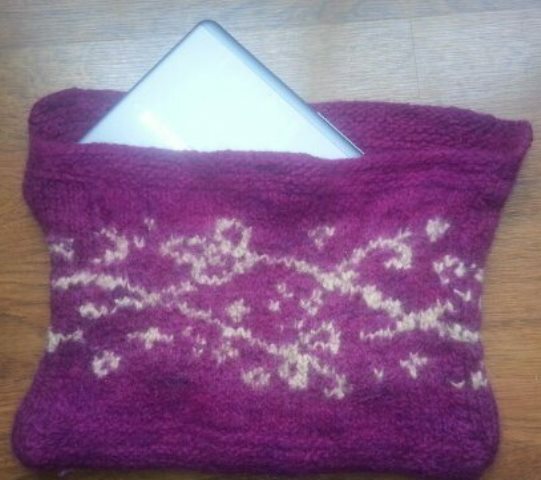 It measure 12 inches x 15 inches (I don’t think I measured it in the same place as before felting) , leaving enough room to carry a little extra in with my laptop. 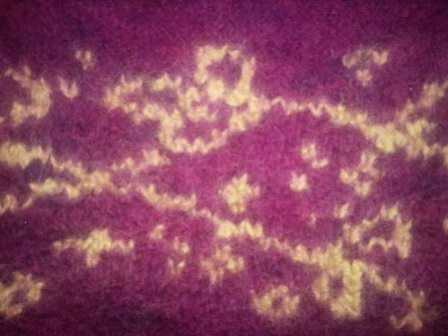 I just need to take a sweater brush to remove some of the pill to make the pattern is more visible, then wait for it to dry. Not sure about doing a lining for it. I also didn’t make button holes, so I have to figure out a closure. If I can bring myself to use a needle and thread then maybe a zipper would work. I really hate sewing, for now this will have to do. I can’t wait to take it to class on Tuesday! Very cool! Love the color. I like the comparison with the broken glass. Contemporary art makes you think!